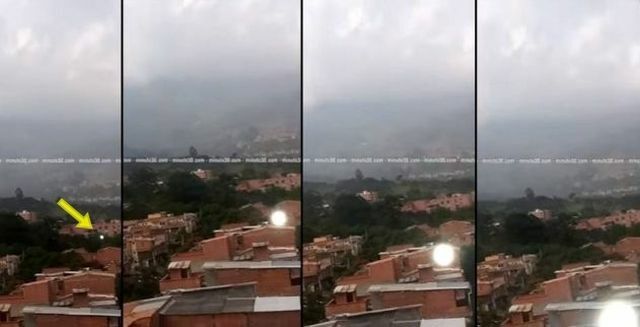 A tourist in Bello Colombia recorded a disturbing video with the camera of his mobile on December 30, 2017. While filming the surrounding area from his hotel room, a ball of light suddenly flying towards the camera of the tourist before it vanishes. It seems that more people in that area have witnessed similar unexplained sightings. One commenter says that he already has witnessed similar ball of lights two times. "It always appears at the same location in the sky, then goes vertically downwards, like an inverted L and flies very low." Since the uploader's account does not show any irregularities such as fake or cgi created videos we may wonder whether the tourist captured a paranormal phenomenon or the creators of the video just wanted to make a prank.